If the noun has already been mentioned in the conversation, it is definite by context. If you say “John found a dog, but later the dog ran away,” you use ‘the’ at the second mention of the dog. We know you’re talking about the dog previously mentioned. Other modifying words and phrases may have the same function as well, such as “the girl who lives next door,” and “the building that has five stories.” However, these phrases will not always use the definite article. You could be talking about any building that has five stories. Once again, the correct article depends on whether or not the speaker is communicating something specific. 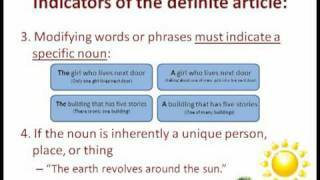 Nouns also use the definite article if they are describing a unique person, place, or thing, such as in the sentence, “The earth revolves around the sun.” ‘Earth’ and ‘sun’ are specific by meaning. In all these examples, the main thing to be sure of is that the speaker and hearer have the same situation or context in mind. While knowing when to use the definite article can be confusing, following these guidelines and looking into additional resources will help you work through all the rules and exceptions. For example, some noun categories, such as languages, nationalities, sports, and academic subjects, don’t use articles at all. You can refer to our website, at writingcenter.tamu.edu, for links to more comprehensive explanations and examples of the correct use of articles. Thanks for tuning in to the last two episodes, and we’ll see you next time, on Write Right.